BOSSY BETTY: Happy Birthday, Mom! My mom turns 87 years old today. Thanks to my incredible sister who lives near her, she'll be surrounded by family and she'll have a good time visiting with her son-in-law, her grandchildren and her great grandchildren. I will send my good wishes from afar, here 2000 miles from my birthplace. After my wedding twenty-eight years ago, my mom presented me with a box of rice left over from the reception, with a twenty dollar bill and a note inside. She wrote she wanted me to have the rice in case I ever wanted to cook it, but she hoped I wouldn't need to. The twenty dollar bill was so that I would never be poor. "There are worse things than being poor," she wrote, "though sometimes you wonder." My mother recognized the security the box of rice and money would bring me because, unfortunately, she lived through years of poverty and little hope of escaping from it. When she was 20 years old she was given a glimpse at another world when she had the opportunity to go to college for a short time to get an emergency credential to teach during WWII. She never forgot those two years of college and although she never said so, I know she would have gone to college longer if she could have. Instead, she came back to her hometown to fulfill her obligation to teach. Soon after, she met my father and settled down on his family farm. 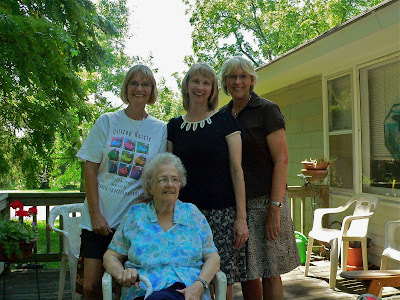 She had five daughters with my father and every year was a financial struggle. When I graduated from high school, most of my classmates' parents urged them to get jobs, apartments and cars. Not me. Even though, economically, I was the least likely in my class to go to college, I was the first one signed up. Grants, scholarships, and my mother's determination got me to the university. There was never any doubt in her mind (or mine) that I was going to college--I was just raised believing I would. Years later, I was reading an article orb weaver spiders and how they build their webs. They begin the whole miraculous process by sending out a bridge line into the wind so that it connects on something. Once that bridge line is secure, they can build their webs. I know it was through my mother's sheer will that she cupped her hands together and boosted me up and out of that mire of poverty, making sure the winds were blowing in the right direction so that my silk thread, my bridge line, connected to education. Thanks to her urging and some inspirational teachers along the way, it stuck. I was able to make my way over on that line and begin building my life on the solidity of education. My mother always told us when we were young that we could go anywhere, and do anything. She urged us to fly away and make our own lives. Now that I am a mother, I see that is true love. BB, please pass my birthday wishes on to your mother! I hope she has a wonderful celebration week (because a day just simply isn't enough)! If you still have the rice you should cook it to celebrate. Or maybe wait till she turns 90.
bb -- this is not the first of your postings to make me cry. thank you. happy birthday bb's momma.